This Adobe Lightroom Develop preset package includes 42 of Nicole S. Young’s most-used presets and a 16-page PDF manual, which includes installation instructions and complete before/after catalog of photographs of each preset to give you a sense of what to expect. Presets are extremely helpful in making one’s workflow more efficient. They also give us new ideas about expression, and, if you take the time to look at the changes they create, can help you learn Lightroom in new ways – you’re going to love using these! These presets are compatible with Adobe Lightroom 4 and 5. Learn more about this toolkit, and how you can save 20% on the Preset Bundle, also giving you LR Develop Presets from David duChemin and Dave Delnea – over 100 presets, total, at CraftandVision.com. Nicole S. Young is a full-time, Seattle-based photographer and author. She specializes in food and stock photography and licenses her images through iStockphoto and Getty Images. Nicole’s resume includes four titles published through Peachpit Press, an Adobe Certified Expert (ACE) in CS4/CS5/CS6, and a regular Lightroom and Photoshop contributor on the National Association of Photoshop Professionals and Photofocus websites. 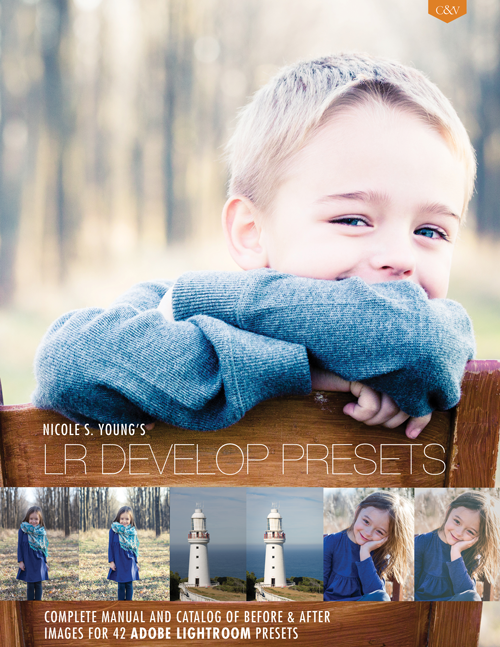 The retail price of Nicole S. Young’s LR Develop Presets is CAD $10. Before Feb. 3 at 11:59 PM (PST) you’ll find the 25%-off discount code (so you can save $2.50) exclusively in Craft & Vision’s Contact Sheet, and you can get that, if you don’t already, by signing up here – you’ll get the auto-responder inside the hour. I can’t find the Discount Code for the Nicole Young’s LR Develop Presets. How do I locate the code? Hi Bob! The discount code is in the latest email campaign (The Contact Sheet) – you can sign-up here: http://eepurl.com/Dkq3H and it will auto-deliver to your inbox within the hour. I look forward to more browsing and downloading. But I really look forward to snapping more pictures and using some of these presets to get the look I envisioned.